What doesn't look right with this picture? Could it be? Did AMD really inject the old Athlon series with new life?!?! Damn right they did! With the new processor series come new marketing logos, so here are the fancy new logos for each respective series. These will be used on retail boxes and for promotional ads, so get used to seeing them for some time. Today, AMD is announcing not one, but two new exciting 45nmdual-cores! First, they are introducing the first-ever Athlon IIprocessor. AMD figured the 65nm Brisbane core has served its purposeand unleashed the new 45nm Regor bases cores to power the Athlon IIseries. 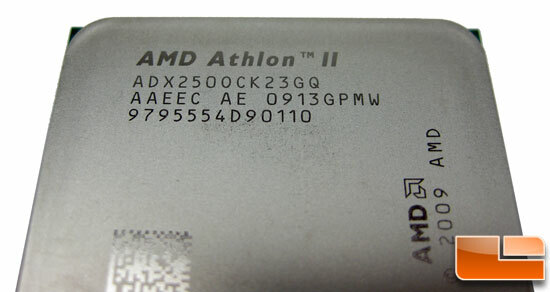 The processor AMD released to launch the AMD Athlon II seriesis the AMD Athlon II X2 250, which is rated at 3GHz with 2MB of L2cache. The next processor is the first dual-core 45nm Phenom II processorknown as the Phenom II X2 550 Black Edition. This processor is basedoff the Callisto core and is rated at 3.1GHz with 2MB of L2 cache and6MB of shared L3 cache. The Phenom II X2 550 is the flagship AMD PhenomII X2 processor and as a result it will be an unlocked "Black Edition"making it a ideal for enthusiasts wanting a dual-core processor. AMDhas informed us that both of these processors will be high-volume CPUsthat they can pump out to their partners just in time for the"ready-for-Windows 7" sales rush system builders are expecting laterthis year. Taking a closer look at the Athlon II X2 250 processor with CPU-Z 1.52 you can see the details on this 3GHz, 45nm native dual-core die that comes in at a cool 65W max TDP. This new dual-core processor has a 1MB of L2 cache per core, but has no L3 cache. The Athlon II series will AMD's first processor with hardware C1E (a low-power state). Moving this power state out of the BIOS and into the CPU microcode will enable AMD to ensure more consistent power management implementation across platforms. This is good news as systems will be more energy efficient as a result of this change. This processor sports the fancy new Socket AM3 938-pin micro-PGA package so it will work in all Socket AM3 and AM2 motherboards with both DDR2/DDR3 memory solutions. 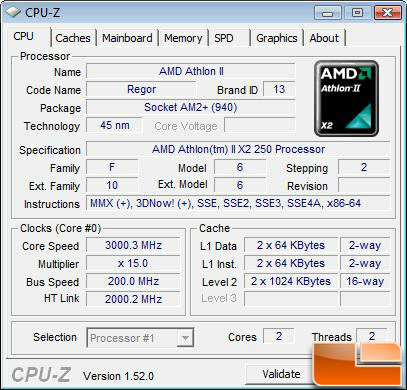 The AMD Athlon II X2 250 will be released at the $87 price point, which is spot on for a 3GHz dual-core processor. If you want a little more clock frequency and a larger cache the AMD Phenom II X2 550 Black Edition processor might be the better choice for you. At 3.1GHz with a full 6MB of L3 cache this 80W TDP processor should be a better choice for enthusiasts and gamers. Being an unlocked chip (can raise and lower the multiplier) the Phenom II X2 550 should be a decent overclocker as long as the large cache plays nice. Just like the Athlon II X2 250, this processor is designed for socket AM3 motherboards and, more specifically, AMD's Dragon platform. At $102 the Phenom II X2 550 Black Edition is another strong 45nm desktop processor that AMD has now made available to consumers. The AMD Phenom II and Athlon II product stack is starting to looking strong as usual with prices starting out at $87 and rising up to $245. AMD clearly has budget friendly processors that have great features and clock frequencies. AMD is stocking vendors now with the new dual-core processors and expects processor availability approximately one week from today. AMD wanted to announce these new processors during Computex, so that is why there is a slight paper launch to this announcement. 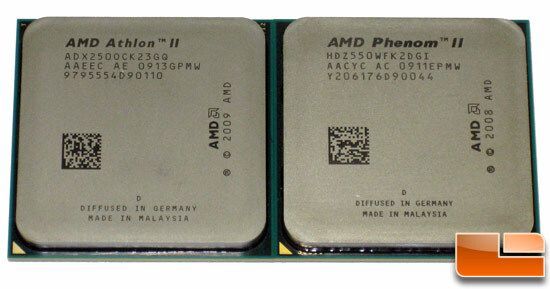 Let's take a look at how the AMD Phenom II X2 550 and Athlon II X2 250 do against 27 other processors.